While in Barcelona I was walking down Las Ramblas, a popular shopping street in the center for tourists as well as locals, with a tour guide who pointed out a popular food market worth a stop, La Boqueria. I found this to be the opportune time to inquire about just what is Catalan cuisine exactly. What should I be expecting from this specific region of Spain apart from the general Spanish dishes like cured hams and cheeses, patatas bravas, the Spanish omelette, or croquettes? “It’s often a mixture of meats and seafood,” explained my guide. “It’s not uncommon to see things like meatballs with a fish sauce.” Basically Catalan food is quite representative of its contrasting terrain from the mountainside to the seaside. There’s no fear in mixing seafood with meats. Throughout my stay I also learned about many local Catalan dishes such as calçots which are like spring onions that are typically grilled and dipped into romesco sauce, a refreshing and slightly sweet red pepper sauce that balances with the savory grilled spring onions. Of course there is also pa amb tomaquet which is just as its Catalan name states, bread with a tomato sauce that is sometimes served with anchovies or serrano ham. 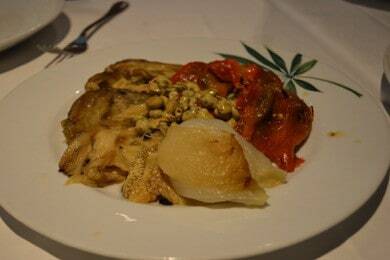 I also tried escalibada, a cold vegetable dish that I must admit I was not so fond of consisting of eggplant, broad beans, red pepper, and onion with garlic and oil. Crema catalana was a dish that I eagerly devoured a few too many times. 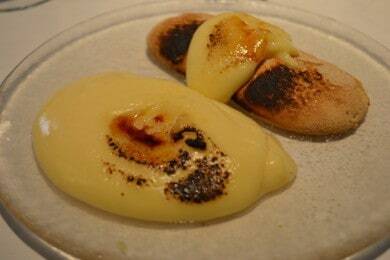 It is basically a Catalan version of crème brûlée and easy to find around the region, but be warned that some crema catalananas are much better than others. Just about all these dishes mentioned so far can be ordered at Elche, a great restaurant found in Barcelona’s Poble Sec district. However, the dish that most caught my eye this trip was catalan fideua. I discovered it at El Cangrejo Loco, a restaurant with stunning waterfront views in the Olympic Port of Barcelona. This dish is essentially the overlooked cousin of paella, which is perhaps the most internationally well known dish from Spain. Paella originated from the Valencian region of Spain and somewhere along the way fideua was born from it where it worked its way up to Catalonia to become the catalan fideua variant of the dish. The most important difference between paella and fideua is that paella is a rice based dish whereas fideua is a noodle based dish. But the variations don’t stop there. The difference between valencian fideua and catalan fideua is the noodle thickness, with the Catalan version being thinner than the Valencian one. These can seem to be minute details, but apparently everyone has their preference. There’s also an endearing tale about the how fideua came to be. It goes that fishermen during the early twentieth century used to eat a common seafood rice dish, but the skipper of one particular boat loved rice so much that there was never enough for the rest of the crew. Therefore, one crew member substituted the rice with fideos, or noodles, and fideua was created along with its many adaptations. The dish is made with short lengths of pasta, fresh local seafood like fish, squid, shrimp and prawns and cooked in a paella pan which is a wide and flat shallow pan. Its base is a fish broth and it can also be dressed with a squirt of lemon. To top it off, it is served with allioli, a wickedly delicious garlic mayonnaise sauce which adds the perfect creamy taste to the dish. In fact, I find allioli goes well with just about anything. 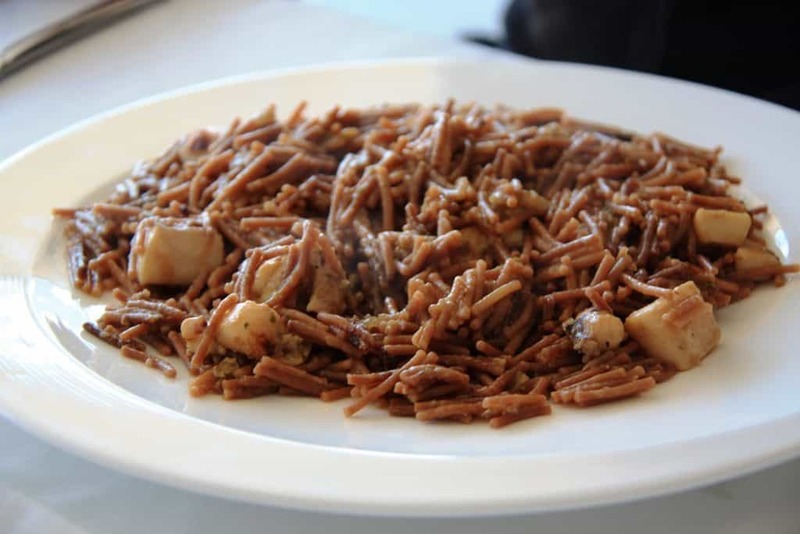 As fideua is prepared in quite a large quantity, it is one of those perfect dishes to be shared with family and friends around the table, catching up while enjoying a common Catalan dish. With its close relation to paella you might even be tempted to pick a side, preferring one dish over the other. After all, Spain is all about rivalries, be it between soccer teams or metropolitan cities. 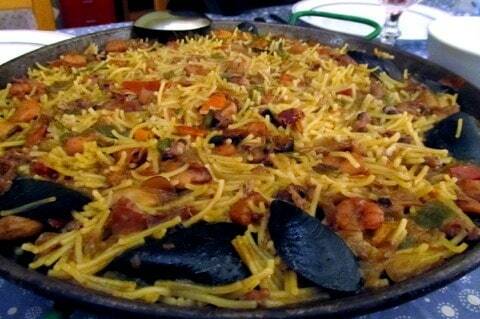 I however, could not say whether I prefer fideua or paella. I think both dishes stand quite well on their own, but that is something you’ll have to decide for yourself. Either way, it’s an incredibly rich and savory dish that embodies the Mediterranean diet of Catalonia. 1. Make the broth: Put 3 tablespoons olive oil in a heavy soup pot over medium-high heat. Add onions and sauté until softened and lightly browned, about 10 minutes. Add small shrimp, garlic, hot pepper, fennel, coriander, bay leaf and thyme. Season generously with salt and pepper, stir to coat and cook 2 minutes more. 2. Stir in tomato paste and cook 5 minutes, until mixture begins to look dry. Add fish bones, clams, 1 pound mussels and 8 cups water; cover and bring to a boil. Uncover, reduce heat to a simmer and cook for 45 minutes. 5. Place a cazuela or wide heavy pot on the stove. Add toasted noodles, pressing down a bit. Ladle 3 cups hot broth over noodles and bring to a boil. Push down on the noodles with a wooden spoon as they soften into the broth. Add saffron-infused water and cook for a minute, then stir to mix. Add enough hot broth to cover pasta by 1 inch. Lower heat and cook at a simmer for about 8 minutes, stirring occasionally. Add more broth (and adjust heat) if mixture dries out. 6. Scatter remaining 1 pound mussels over the top, then push them down until barely submerged. Cook 3 to 4 minutes, until shells open. Turn off heat. The noodles should be cooked but firm, and the mixture a little soupy. 7. If using the large shell-on shrimp, season them and sauté in 1 tablespoon olive oil over medium heat for 2 minutes per side. 8. Ladle into individual soup plates. Mix the parsley with the orange zest. Garnish fideus with shrimp, if using, the parsley mixture and a spoonful of allioli.